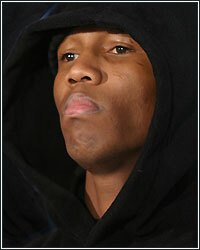 With the speed, power and talent that he possessed, nobody ever thought that after Zab Judah knocked out Cory Spinks to win the undisputed Welterweight title, his career was headed headfirst into murky waters. Judah was ready to make a statement that he was the best the world had to offer, that he was a fighter not just for our time, but for all time. It's been over six years since the biggest win of his career and that statement has yet to be made. Following Judah's victory over Spinks in St. Louis, he would lose the title in a mandatory defense against Carlos Baldomir, caused a near riot against Floyd Mayweather Jr., got beaten up by Miguel Cotto, and was stopped on cuts against Joshua Clottey. To sum it all up, Judah went from pound-for-pound contender to borderline gatekeeper in a span of five years. Yet here he is, two months away from completing his long road back to relevancy against Kaizer Mabuza for the vacant IBF Junior Welterweight title. It's been a long road for Judah. His near fall into obscurity allowed him to take a long hard look into the mirror and realize that career changes had to be made in order for him to continue fighting at a high level. The first step was to make it back to Junior Welterweight, where he won his first world title, because Judah was simply just too small for 147. Second was to replace his head trainer and father, Yoel Judah, with Eddie Mustafa Muhammad to get a real fresh start on the second half of his career. It all culminated in Judah's best performances in years: a third round TKO of Lightweight contender Jose Armando Santa Cruz. Still, I wasn't convinced that Judah was any different that night. For one, everybody knows that Judah is probably the most ferocious and deadly fighter in the first three or four rounds of any fight he's in. He was clearly beating Mayweather and Clottey for the first four rounds, and he even nearly knocked out Cotto in the first round of their fight, but they would survive the onslaught while Judah would gas out and get dominated down the stretch. My suspicions would be confirmed in Judah's near miss against Lucas Matthyse last November. He won that fight by split decision, but it was a far cry from the crushing victory against Santa Cruz. Interestingly enough, Muhammad was not in Judah's corner that night, but Yoel Judah was, so if Muhammad had in fact changed anything about Judah, it never would have came to light. The win over Matthyse now has put Judah directly into title contention, and a win over the rugged Mabuza, who forced former champion Kendall Holt to quit on his stool in his last fight, will solidify his return to the big stage of the game. I absolutely think Judah will beat Mabuza; Holt should have beaten him too, but it looked like he didn't train properly and was rightfully beaten. From what I have heard, Judah is taking this fight very seriously, as well he should, since a loss to Mabuza is a setback that he really can't afford at this stage of his career. If he wins, Judah will finally end his six year journey to become a champion again. He will be in position to once more make his mark on the sport and come one step closer to building Hall of Fame credentials. It seems odd enough that it has taken Judah this long to return to prominence with the amount of talent he has, but boxing has seen weirder things before. Judah's career ressurrection from here on out is going to be based on his desire to succeed, and his continued chase of that success, should he mentally hold up, may mean we're all in for a big surprise.